Edwin S. Porter was an important and influential pioneering filmmaker in his own right, but there’s no doubt that he, in turn, was influenced by the French trick filmmaker, Georges Melies, particularly when making Jack and the Beanstalk in 1902. Apparently, Porter would obtain prints of Melies’ films on behalf of his employer Edison and study them closely to figure out how the Frenchman created his tricks in order to replicate them in Edison movies. In Jack and the Beanstalk he uses such familiar Melies techniques as double exposure, substitute cuts and animation. The story will be familiar to anyone who attended the pantomime as a child, and in fact, watching Porter’s Jack and the Beanstalk is much like watching the play performed on stage. 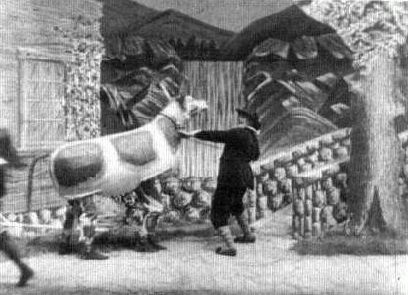 It also begins with a comical pantomime cow, played by two men in a suit, who performs a distracting little dance as the hapless Jack (Thomas White) negotiates its sale in return for a hatful of beans. The cow’s new owner then has something of a battle persuading the cow to come with him until he whispers something in its ear. Jack’s mum isn’t too impressed with the deal Jack negotiated, and sends him to bed, where he has a dream influenced by a fairy godmother whom we previously saw coaxing the titular beanstalk from the earth. The following morning, Jack climbs the beanstalk and, after another vision from the fairy godmother, finds the giant’s house. While the giant sleeps, Jack steals four bags of gold and a goose and makes his escape with the angry giant in hot pursuit. Although there’s no doubt Porter copied many of Melies techniques, he also improved on the Frenchman’s films in some ways. His sets are much more impressive, and he resists Melies weakness for overfilling the screen with extraneous props and set details that often distract the viewer from the action that they should be watching. Having said that, Porter’s movie lacks Melies’ infectious, manic energy. It’s noticeable that Jack and the Beanstalk also takes no moral position on Jack’s action, even though it declines to make the Giant — who’s really just a very tall man — a villain of the piece. That effectively makes Jack a thief and a murderer who suffers no punishment for his crimes. Jack and the Beanstalk might not look particularly impressive to those brought up on CGI effects, but it’s a film of very high quality for the year that it was made, and was an important stepping stone both for Porter’s development as a filmmaker (he would go on to make the groundbreaking The Great Train Robbery the following year) and the evolution of the cinema.